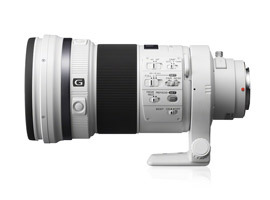 As the second most expensive and second longest fixed focal length lens in Sony’s line-up, the 300mm f/2.8 G SSM II has been updated to include Nano AR coating, enhanced weatherproofing, and an overhaul of the ultrasonic-type (SSM) adding object tracking during video capture with the hybrid AF system of the Sony SLT A99 (including the 102 AF point phase detection system). The $7,498 price seems rather high given the optical design remains unchanged with 3 ED (extra-low dispersion) glass elements out of a total 13 in 12 groups, and the fact that savings must be made from not having image stabilization (it’s not required as SLT cameras adopt a stabilized sensor platform). With a DxOMark score of 24 points mounted on a Sony SLT Alpha 99, the Sony 300mm f/2.8 G II is a good performer but it’s not outstanding which is a surprise for a high-end (and high value) lens like this. Sharpness is somewhat disappointing at 15P-Mpix, given the theoretical maximum of 24P-MPix on the A99. As for Transmission, Distortion and Vignetting this lens performs very well indeed, while Chromatic Aberration is still low for a fast aperture telephoto (but still not the best in class). When compared to the latest Canon EF 300mm f/2.8L IS II USM version fitted to a 22-Mpix Canon EOS 5D Mk III, the Sony 300mm f/2.8 G II combination doesn’t fare particularly well. 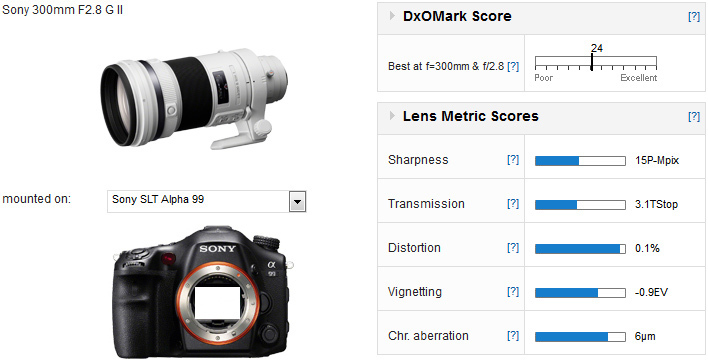 While it can hold its own against the Canon in Transmission, Distortion and Vignetting (and CA for all intents and purposes), the Sony’s Sharpness score is discouragingly low compared to the Canon equivalent. 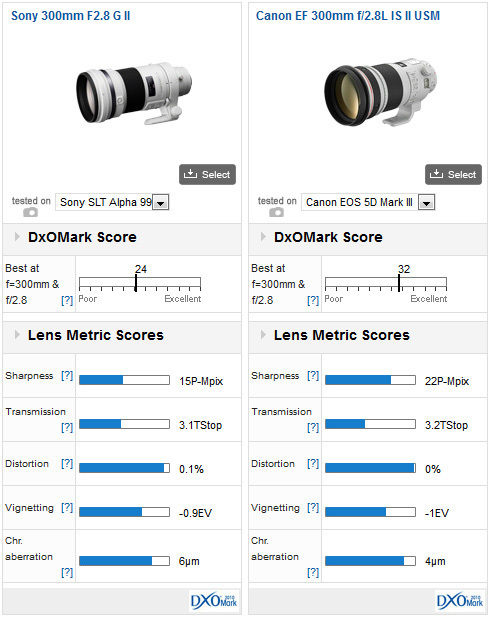 Given the Sony SLT A99 has a slight advantage in pixel count over the Canon EOS 5D Mk III is only more revealing.In fact, with a Sharpness score of 22P-Mpix the new Canon lens can clearly out-resolve the best performing sensor in Canon’s range currently. Sony’s revisions to this lens, have been principally aimed at improving handling and compatibility with current cameras, especially with regard to AF during video capture. While the enhancements are welcome, the optical design is beginning to show its age against rival offerings lenses specifically designed for current and future high-resolution image sensors.